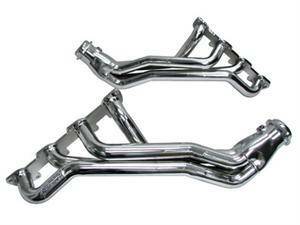 BBK Performance Long-Tube Headers & Mid-Pipes for 05-19 Chrysler 300C, Dodge Challenger, Charger, & Magnum 5.7L Hemi. BBK 5.7L Hemi Long-Tube Headers are availale in Chrome or Silver Ceramic & Mid-Pipes are available with or without High-Flow Cats! BBK R&D department developed these Dodge Hemi 5.7L Long Tube Exhaust headers with one thing in mind: getting even more horsepower and torque out of the popular 5.7L Dodge Charger, Challenger, Magnum and Chrysler 300C. This BBK long tube header is constructed with 1-3/4 CNC Mandrel-Bent tubing and solid 3/8 laser cut exhaust flanges. These short BBK mid pipes are manufactured from 2-3/4" CNC mandrel bent 304 stainless steel and available in straight pipe off road version or a high flow steel substrate catalytic converter version. They are required to complete the installation of the BBK Dodge Hemi, Challenger, Charger, Chrysler 300, SRT8 5.7L - 1647 series 5.7L Full length long tube headers. 5.7L HEMI LX/LC VEHICLES RUNNING BBK LONG TUBE HEADERS (PN's 1647 or 16470) & MIDPIPES (PN's 1796 or 1797) REQUIRE A TOTAL OF 4 EXTENSION HARNESSES (2 SETS). THIS INCLUDES 1 KIT (x2) FOR THE FRONT O2 SENSORS & 1 KIT (x2) FOR THE REAR O2 SENSORS.